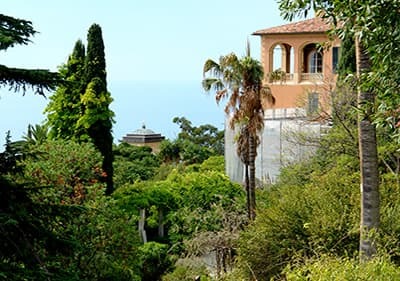 The Hanbury Gardens are located in Ventimiglia near the French border. The origins of the garden go back to the year 1867. The gardens were founded and named after Thomas Hanbury, who was born in London and made his fortune in Shanghai; and who loved this coastal strip due to its mild weather. In a strategically convenient position, the gardens give a number of magnificent panoramas. A lush vegetation provides the framework, where Mediterranean Macchia (scrub) and the more exotic representatives of the plant world prosper. Altogether the gardens contain approximately six thousand different species of plant life. The result is a small, utterly charming paradise where each flower, plant, bush and hedge has been catalogued and listed. 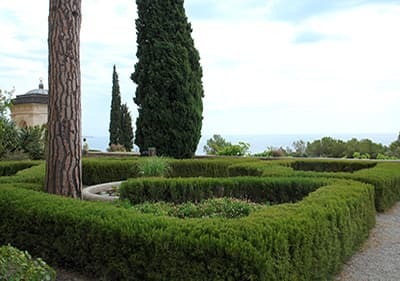 The Gardens, which have contributed much to the development of garden architecture and botanical research through the years, also incorporate the historical Via Julia Augusta. The best preserved section of the old roman road can also be seen within the confines of the Gardens. As the roads were important to the Romans, all other roads in this area were either laid parallel or at right angles to this one. The antique stone supporting walls were also preserved. The different levels are connected by flights of steps, ramps and curved walkways. The goal of the Hanbury family (Sir Thomas, his son Cecil and daughter-in-law Dorothy Symons) was to let the vegetation grow naturally in the more inaccessible zones and, when appropriate, to continue with planting trees (pines and olives), and then shrubs (myrtle, genista, laurel and rosemary). Oleander was planted along the creek, and in the shady and upper areas wisteria and lilac. The walls were covered in of passion flowers, roses, ivies and begonias. The terrace is smothered with geraniums. At the southern side of the Gardens, where the beds are not as cultivated, you will find agaves, aloe, cacti, euphorbia and yucca palms. In addition, you will find the palm garden, the astral forest and the monochromatic garden, in red, white and orange, made up of annual blooming flowers surrounded by neatly trimmed hedges. The beauty of the fruit gardens complements the field full of anemones, irises, crocuses, daffodils and more. 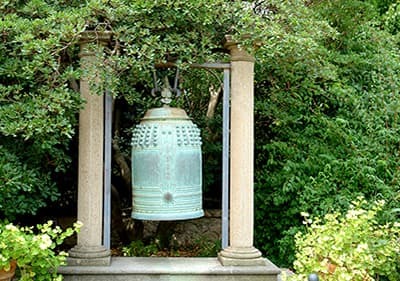 To complete the experience the entire gardens are also liberally dotted with sculptures, fountains, pools, pillars, amphorae, columns, stone benches and temples on every level. The Palazzo Orengo di Ventimiglia (the main building) was also preserved and has hardly changed, except for new work rooms, a tower giving panoramic views of the garden, a terrace, arched loggias and an entrance. The service buildings were situated according to their function. Casa Bellini, under the hothouses, for the workers, and on the east side of the Sorba creeks, a farmhouse used for scientific research, and the museum, which houses some of the Sir Thomas’ archeological finds. On the same level are to be found the gardeners’ house, the cow stalls, the hayrick and Casa Natalni. In order to more easily water the different levels, a levelling of the earth was required. 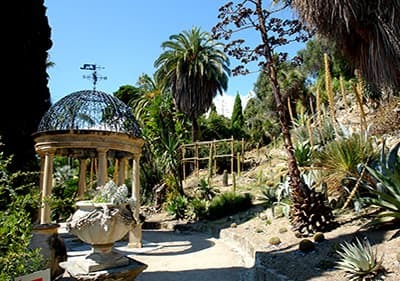 Today the Gardens belong to the Italian State, thanks to an endowment by the Hanbury family, and care and maintenance are undertaken by the Institute of Botanics of the University of Genova. The Hanbury Gardens is situated immediately before the border of France and on the road that leaves Ponte S. Luigi. 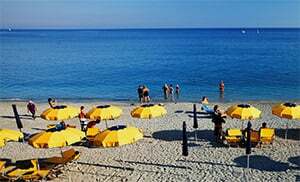 Once you have left Ventimiglia and Latte behind you arrive at a large gate, which forms the entrance to the most beautiful park in Liguria. With an immense number of flowers and tropical plants the garden is a botanical jewel. In the area you will also find the caves of Balzi Rossi (red rock). Here fossils of prehistoric humans, extinct animals and plants were found.